Several cruise lines employ butlers in their exclusive accommodations. Onboard Royal Caribbean International’s ships, they are called Royal Genies.As the co-owner and president of a Virtuoso-affiliated agency, Paul Largay never had much interest in Norwegian Cruise Line. The Waterbury, Conn., travel seller had cultivated a luxury clientele who preferred upscale lines such as Silversea Cruises, Regent Seven Seas Cruises and Seabourn. But after Norwegian added the Haven to its ships, Largay began selling the line. “It’s a very viable alternative,” he said. The Haven, a secured enclave of luxury cabins around a courtyard, has re-engineered Norwegian into a line with both a mass-market and a luxury clientele, and its arrival on the scene has led almost every other operator of large cruise ships to tout some sort of exclusive accommodation. Each has its own variation: MSC Cruises has the MSC Yacht Club, Royal Caribbean International and Celebrity Cruises have Suite Class, Disney has Concierge Level and Holland America Line offers the Neptune Lounge. Even Carnival Cruise Line, the most egalitarian of the bunch, offers the Havana Cabana enclave on its newest ships. The reasons that luxury enclaves have evolved on ships are many, but a common thread is the premium pricing that cruise lines can command by creating an aura of exclusivity to which guests can aspire. Suites in the enclaves tend to be among the largest at sea, an attraction for some guests and yet another revenue enhancement. In most cases, these cabins come with exclusive use of other areas, such as private pools, restaurants and lounges. Several agents compared the rise of luxury enclaves at sea to similar choices in other hospitality sectors, such as a business class on international airlines or private luxury railcars added to trains. Airlines have started opening unadvertised invitation-only dining venues in some airports for their best customers. And hotels-within-hotels are proliferating, especially in Las Vegas. At the Wynn Tower Suites, located in the 2,716-room Wynn Las Vegas, guests have a private entrance, a personal shopper, an exclusive restaurant and a private pool, with amenities. Gaming also played a role in the creation of the Haven, which can trace its origins to large villa suites built for Star Cruises, an Asian line that shares common ownership interests with Norwegian through parent company Genting Group. After acquiring Norwegian in 2000, Genting began to swap ships intended for Star Cruises into the Norwegian fleet. 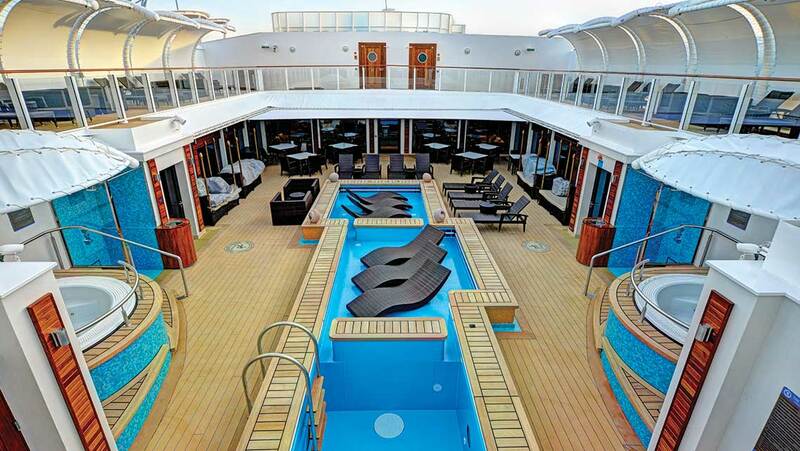 Ships such as Norwegian Dawn have a pair of three-bedroom, $25,000-a-week Garden Villas on the top deck. Those evolved into the Courtyard Villa, an enclave of 12 access-controlled suites when Norwegian launched its Jewel class of ships in 2005. The exclusivity of the Courtyard Villas was one component of a package of extras that has continued to evolve. Rebranded as the Haven in 2011, the enclave cabins now come with access to a private restaurant, a private sun deck, private pool and a dedicated lounge and bar, all within the complex. When Norwegian Cruise Line began offering the Courtyard Villa enclave in 2005, it opened the mass-market line to luxury clientele and prompted other cruise lines to follow suit. The Villa concept evolved into the Haven by 2011. Other benefits include the services of a concierge and butler, priority embarkation, debarkation and tendering and preference for seating at shows and for shipwide dining reservations. In-suite amenities include a cappuccino machine, white-tablecloth room-service dining and sparkling wine, fruit and bottled water on embarkation day. Bathrobes, linens, bath products and mattresses are all top of the line. Enclaves such as the Haven tend to be found on mass-market ships, or at least ships above a certain size. One reason is that smaller luxury ships have no need for a separate high-end product. Just as important, they don’t have the real estate. 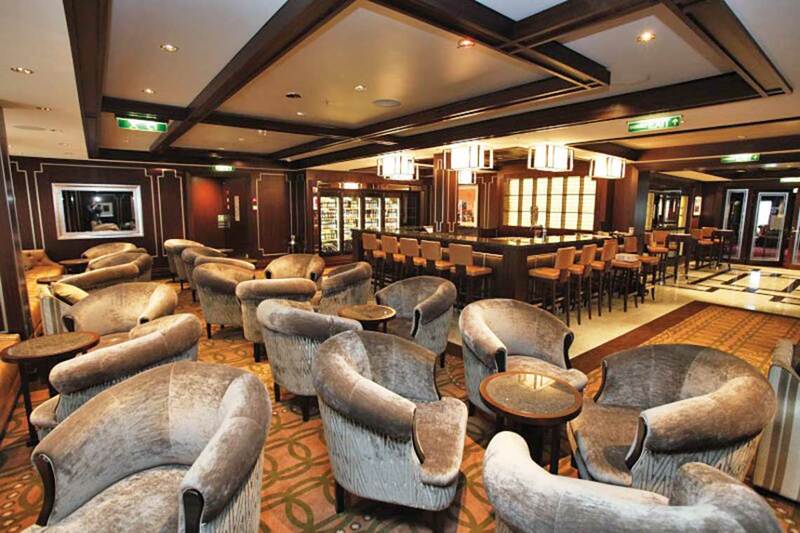 Holland America Line, whose largest ship is the 2,650-passenger Koningsdam, does not offer a luxury enclave but does have the Neptune Lounge, a midship social area with refreshments and concierge service. It is reserved for guests booking the top Neptune and Pinnacle suite categories, who also get exclusive access to the ship’s premier Pinnacle Grill for breakfast. Sally Andrews, vice president of public relations for Holland America, said it’s a question of economics. “Dedicating private space for a segment of guests related to their accommodations really comes down to [return on investment] on use of that space for a small versus a larger number of guests,” Andrews said. Some observers trace the origins of the enclave idea to Queen Elizabeth 2. 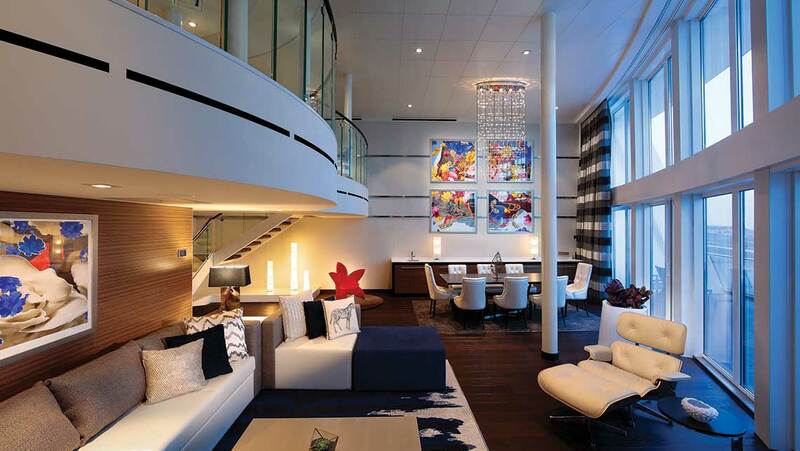 In 1972, a refurbishment of the Cunard Line ship resulted in the addition of 20 penthouses to the 70,000-ton ship. A nearby bar/nightclub was converted to an exclusive restaurant called the Queen’s Grill. 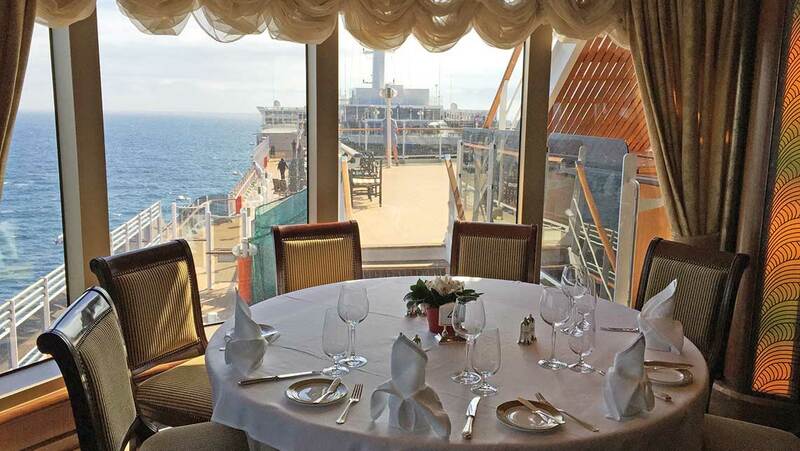 By the time Carnival Corp. commissioned a successor for the ship in 1998, the Queen’s Grill accommodations had become a status symbol, and Carnival incorporated them into the Queen Mary 2, as well as into later ships Queen Elizabeth and Queen Victoria. Larry Pimentel, one-time president of Cunard and currently president and CEO of Azamara Club Cruises, said Cunard was a bridge between the transport era of passenger shipping and modern cruising. Queen Elizabeth 2 was designed with separate classes in mind, with segregated spaces for each price level. “They represented a bygone era of cruising, a bygone era of transport, actually,” Pimentel said. Ships designed for cruising post-Queen Elizabeth 2 were one-class ships, Pimentel said. Only recently have separate classes crept back into the equation, in part to attract and keep a discerning type of customer. The creation of a ship within a ship enables mass-market lines to pitch their cruises to more-affluent guests. The premium for staying in an enclave like the Haven can be five to 10 times the cost of an inside cabin, depending on deployment and time of year. MSC Cruises calculates that the per-person cost of staying in its Yacht Club enclave averages about $1,500 more than for a standard cabin. One longtime observer of luxury cruising said it might or might not be worth the price. “Theoretically, it’s good,” said Mark Conroy, managing director of the Americas for Silversea Cruises. Conroy said one of the most appealing parts of the enclave idea is the ability to offer two ships in one. There’s an “uptown” sanctuary with refined furnishings and service and a “downtown” for energy, variety and scale. But to make it work, the “downtown” has to be worth going to, he said. “The challenge is in the execution, and some companies have been better than others,” Conroy said. Another way the uptown/downtown idea plays out is in attracting large family groups. With an enclave, the luxury client can afford luxury accommodations without springing for a luxury ship for the entire group, she said. 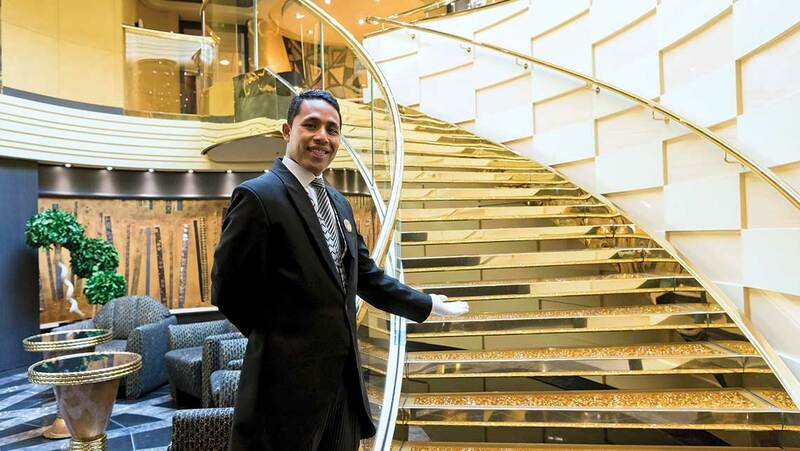 A staircase embedded with Swarovski crystals connects two decks in MSC Cruises’ exclusive section, the MSC Yacht Club. 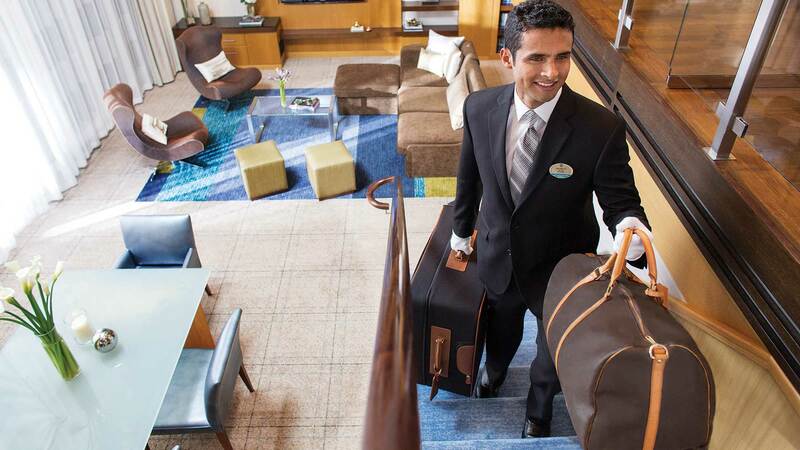 Access to a concierge desk and the Top Sail Lounge are some of the perks for Yacht Club guests. MSC Cruises has earned a reputation for affordable family cruising with its kids-sail-free promotion. Its Miami-based ship, the MSC Divina, is one of five in its fleet equipped with an MSC Yacht Club enclave. The enclave includes 66 suites arrayed over two decks connected by spiral staircases with embedded Swarovski crystals. There is a private lounge, a library and butler service for all Yacht Club guests. They also get an adjacent private pool, access to a VIP area of the disco and special access to the spa. Bernard Stacher, vice president of hotel operations for MSC, said guests are paying for more than exclusivity. “That’s a portion of it, but it’s not the majority,” Stacher said. “It also comes down to the personalized, tailored service, to really unique and fast access to the ship on and off, the choice of the finishings we choose and the no-questions-asked attitude from the staff in the Yacht Club. I think that plays a big part. In marketing the enclaves, cruise executives walk a fine line between appealing to discriminating customers and coming off as elitist. Wetty said exclusivity inevitably rubs some people the wrong way. Wetty said the key for lines that have made an enclave product successful was positioning it as an extra to an already handsome package. The Royal Loft Suite on the Anthem of the Seas. Not every line offering exclusive luxury accommodations has gone the route of building a full enclave. Celebrity Cruises and Royal Caribbean International, both brands owned by Royal Caribbean Cruises Ltd., offer guests a Suite Class package of benefits that includes a separate lounge and restaurant, among other perks. Suites are in different areas depending on which of Royal’s eight ship sizes they are sailing. On Celebrity, Suite Class guests have the Luminae restaurant and Michael’s Club to themselves. On Royal, Suite Class includes a suite lounge and sun deck and the Coastal Kitchen restaurant on some ships. Top suites come with Royal Genies, a name for what other cruise lines call butlers. “We thought it was a fun twist on this idea of a butler,” Royal Caribbean president Michael Bayley said. “We think part of our success is not taking ourselves too seriously.”Bayley said that Royal has the same package of amenities that competitors do, but “we just haven’t put them in one place.” Royal guests, he said, “want to be engaging with the world around them.” Still, he said, he wouldn’t rule out building a dedicated luxury enclave area on future ships. Even Carnival Cruise Line, which prides itself on being unpretentious, has cosied up to the enclave concept. 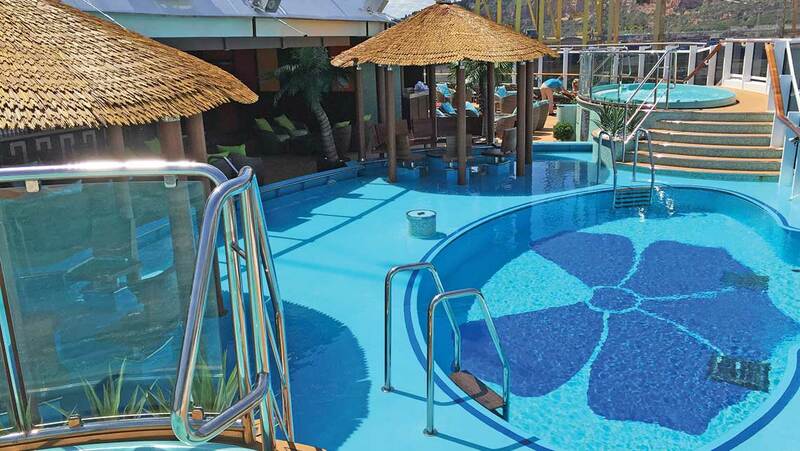 On its latest ship, the Carnival Vista, it has created the Havana Cabana, an area of 61 cabins with a lounge and pool area with a tropical-leisure theme. Most of the cabins are on deck five and feature a sliding door that opens to a 100-square-foot patio with a swing chair. A key-card gate keeps the aft part of the promenade that encircles Deck Five closed during the day. Also behind the gate is the aft pool and hot tub area. A few Havana cabins are located on decks six and seven and have enlarged balconies rather than patios; these cabins also include access to the pool. Carnival Cruise Line president Christine Duffy said that limiting access to the pool hasn’t caused any issues. The Havana Cabana is the only area on Carnival’s 25 ships that aren’t open to all passengers. “We really haven’t had any complaints, as there are so many other options on the Carnival Vista,” Duffy said. Carnival is expanding the area on the Horizon, due in April, by 18 cabins. Other luxury enclaves are also growing. The Yacht Club on MSC Seaside, which will be christened in Miami in December, will have 80 suites, the most ever. In the future, cruise executives said, the enclave concept could be expanded to include more dedicated entertainment. MSC has a piano player in its Yacht Club, and it will rotate a violin duo into the mix on the Seaside. Pimentel said that other ideas will percolate for small musical ensembles. Princess Cruises has revealed further details of its next three Royal class ships, which are set to be built by 2022. Tony Roberts, the line’s vice-president, UK & Ireland, announced the fourth Royal class ship will make four weeks of sailings in the Mediterranean from October 2019. Speaking at a media and trade event, he added that it was a “great opportunity to get on to the newest ship” when itineraries go on sale in a “few weeks’ time”. The ship’s name will be announced later this week. Roberts also chose not to reveal the name of the fifth ship in the class, launching in summer 2020. However, he did hint that the vessel would operate not far from the Italian shipyard where it was built. “I am not going to place any bets on where she is but she has been built in Italy so there is a pretty good chance that she will be around [in Europe] for part of summer 2020,” Roberts added. Princess will also launch another Royal class ship in 2022. Roberts told the audience that TV presenter Jane McDonald had recently filmed on one of Princess’ ships as part of her cruising programme. Earlier, Princess Cruises announced 2019 would be its longest ever season sailing out of the UK. More than one million cruise nights will be available from Southampton and Dover. The 2,670-guest Sapphire Princess will spend 198 days sailing from her home port of Southampton – the longest recorded time for a UK-based Princess ship. It is the second new MSC ship to come into service in 2017 and will homeport in Miami for Caribbean itineraries. It is the first in MSC’s Seaside Class. MSC Seaside weighs 169,380 tonnes and can take 5,179 passengers. At the ceremony, in Italy, MSC Cruises and Fincantieri also signed firm orders for the €1.8 billion construction of two Seaside EVO ships. MSC Cruises executive chairman Pierfrancesco Vago said: “MSC Seaside coming into service marks another key milestone in the history and future of our company, but she also embodies a pivotal moment for the industry. In fact, she is the first ship of the fifth new prototype that we bring into service and introduces a wholly-innovative product that sets a new standard for the industry to follow. Italian president Sergio Mattarella and Graziano Delrio, Italy’s minister of infrastructures and transports were among the dignitaries at the ceremony. MSC Seaside’s sister ship MSC Seaview will come into service in June 2018, starting her summer season in the Mediterranean. At the delivery ceremony, Vago also announced that MSC Seaview will be christened in Civitavecchia, Italy, on June 2, 2018. Giuseppe Bono, chief executive of Fincantieri, added: “We are proud to have accomplished such an important project: a ship, for a new customer, the largest one ever built in Italy. This demonstrates not only our ability to satisfy the needs of the shipowners but also the extraordinary operational level which Fincantieri has achieved. In total, 12 new MSC ships are to be built by 2026, for an overall investment of €10.5 billion.